I've spent two full mornings trying to find an original way to teach kids Dolce Sight Words. I blogged previously this morning on two first grade blogspots I love and their ideas, but nothing really got me excited enough to "think outside the box." But...what if you printed with different colored sharpies those words onto clothespins. You could find cute tubs or jars or cans to decorate for each list. Then, you've got a portable interactive manipulative for learning (wasn't that a mouthful?). 1. Pick a clothespin. Read it. If you read it, try to drop it in a bottle. (Hey, didn't you guess that one was coming)? 2. Make a clothesline. Attach a picture of the word, or card with it in a sentence, and hang it with the clothespin to the line. 3. Clip the words you don't know to your shirt. Wear them around. Ask friends to help you learn them. 4. Use the pins as playing cards. Have four of each word. Have kids sit in a circle. Play "Go Fish." 5. Have each student take turns drawing a clothespin out of the tub. Make sure the kids have paper hats on before they start. If they CAN read the word, they get to attach it to their hat. If someone gets a pin that says, "Loose your pins" they have to put their pins back in the tub. (Have lots of these pins). Person with the most pins on their hat when time is up WINS. 6. Have sentence strips with pictures and/or sentences with the word. Draw a pin and match it to the sentence. These sentences and strips can be small. Or color code your pins to paint sample strips. Play a matching game. 7. Tape the paint slips to sides of the kids desks to clip words to learn to. 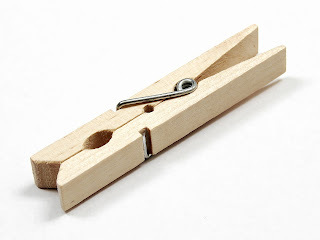 Clip the clothespins to these strips. Give the kids a time limit to learn them by. 8. Drop them in a big pile on the floor like Pick-Up-Sticks. They have to be able to read the word in order to pick it up. Play by Pick-Up-Sticks rules. 9. Make small paper slips with the words on them. Scatter them around the room. if a child cannot read the word on the clothespin. they must gather with the pin as many of the paper words as they can that match the pin. 10. Most fun of all, use them like jacks with a small bouncing ball. They have to be quick and read the words before they can pick them up.